A handsaw with one long blade, a keyhole saw is ideal for piercing through materials and cutting out small shapes. 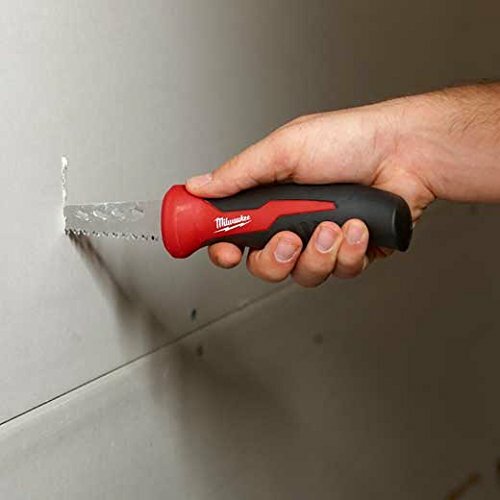 Also called a jab saw or drywall utility saw, this is an essential cutting tool for drywall projects and more. This is the classic cutout device, used to make rough incisions and saw out holes for switch boxes, pipes and other small openings. They are primarily designed for drywall of standard thickness measurements such as thin 1/4″, 3/8″, 1/2″ and 5/8″ types. Keyhole saws can also work on rubber, plastics, carpet, and other rigid but thin materials. They won’t be strong enough for any special acoustic drywall types that have concrete in them, or other harder materials like plywood or tile (you need a tile saw for that!). Cutting or sanding drywall can be a dusty situation, but since keyhole saws are manual tools you won’t get a lot of fine particles, but do plan to get your vacuum out after making even small cuts. The special talent of the keyhole saw is that you can start making your cut in the middle (or field) of a drywall panel. Hence the name, you jab the saw’s tip into the gypsum and begin sawing back and forth. Most keyhole saws do their cutting on the push motion, though some nicer types have teeth that work on both push/pull motions. You can also keep this guy on your tool belt if you like, for those inevitable quick cuts. As simple as they are in concept, these cutters actually come in a variety of forms. Blade options, handle types, teeth count and lengths all play a part in making these them perform differently. Here are a few examples, along with advantages and other considerations. There are many “standard” type jab saws, that is, those with a basic handle and fixed blade. Rigid blade won’t bend and won’t get caught up during strokes. Sharp blade point pokes easily through wallboard. Handle is soft-grip and comfortable for people with big hands. Teeth stay sharp, even ever extended use. Handle feels big if you have smaller hands. Good all-purpose saw, but limited to the one, fixed blade. The word fancy doesn’t do this model justice. This thing is more like a hand-powered reciprocating saw. The biggest key feature of this tool is that you can turn it into whatever kind of cutter you want with it’s interchangeable blades. It’s definitely one of those tools you will have forever! Definitely the ability to replace and alter the blades. That means this saw can be put to a multitude of uses, especially with specialty or sawzall blades – even though that rival power saws! Not that it matters in most cases, but you can add an extension to it via the end of the threaded handle. Good for demo’ing walls or cutting out door/window openings if you won’t want to bother with a reciprocating saw. Reliably holds blades in place. Blade is held at a slight angle for better ergonomic feel. A little more pricey, i.e. twice as much as a standard keyhole saw. If you just want your keyhole saw to work on drywall, and care more about being able to reposition the saw for better angles and fits, then consider this 4-position model. his saw is probably fine for most homeowners who don’t need to do a variety of functions with this device. Be careful with a lesser priced model like this. It won’t perform quite as good as the ones mentioned above. Things you’ll run into is that the blade may bend at times in thicker wallboard. You may also need to pre-drill a starter hole before diving the saw in to make your cut. Finally, don’t be surprised if it can’t handle other materials that single-position blade types can take on.